I have always thought of myself as a creative person. I was a kid who was very proud of the fact that she could write acrostic poems that rhymed. Whenever my parents dragged me to a DIY store I would go around collecting samples of wallpaper and paint chips to use in collages. As I grew up I discovered other crafts, and started writing more and more, and my idea of myself as a creative person solidified. 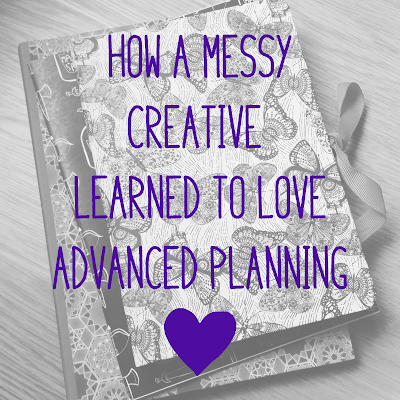 For a long time I believed that creative = messy and disorganised. Creative people don't do routines, I thought. Creative people love things to be spontaneous and unpredictable! I didn't challenge these beliefs, even when my responsibilities threatened to overwhelm me. I love being busy, so I said yes to everything. My life got chaotic and I frequently forgot social events and meetings at university. Once I double-booked myself and then slept in and didn't go to either meeting! It was embarrassing, but more than that, I hated that I'd been so unreliable - having prided myself on being resolutely reliable. I always turned up and got things done when I said I would - until I didn't. There was no way I could remember everything I was supposed to do, when I'd decided to do so much! I didn't want to cut back on my commitments, so I got a diary, and everything changed forever. 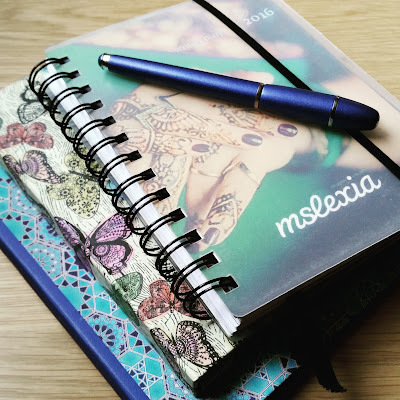 I'm still a massive fan of the Mslexia Writer's Diary after seven years! Being organised was wonderful. I knew exactly where I was supposed to be when. I put all my events and activities in my diary, and I never double-booked myself again. My brain was suddenly free to devote itself to a higher purpose - I found that I was more creative now I wasn't struggling to remember dates and times. I could see upcoming deadlines, and I started to plan for them, rather than letting them catch me by surprise. Over the years, I've gone from just having a diary to having a range of systems I use for different purposes. I have routines to make everyday life simpler, and processes for planning elements of my life to make them easier. Sometimes people comment that the way I live seems very rigid and controlled - but it's exactly the opposite! With routines and scheduling and careful planning, I have actually set myself free to do more of all the things I want to do! I can think critically about how I use my time and make adjustments so that I can focus on particular projects or spend more time with loved ones. I'm not perfect - I cannot keep my desk tidy and have to clear it out and rearrange everything every few weeks - but I am more productive and happy than I've ever been. I frequently find myself advising other people on organisation, and I'm happy to share my tips. I've found that advanced planning brings advanced peace of mind, and isn't that something everyone could benefit from? I've decided to write more about organisation, as it's benefited me so much. 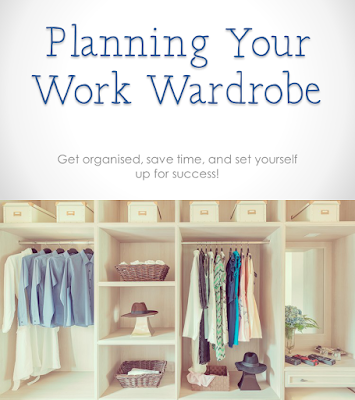 This post is the first step, and my second is my first ever ecourse: https://www.udemy.com/planning-your-work-wardrobe/?couponCode=1010JAN16, which goes in-depth into the system I use to plan my outfits for work when I'm going through a busy time or just want to give myself more brain-space in the morning. I'm using it right now, because the temperature in London is below zero and planning all those layers first thing in the morning is too much! Let me know in the comments how you feel about being organised - is it something you've embraced already, or do you feel like you need more guidance? Your journey with organisation issues is familiar to me Julianne. Another alternative would be to relocate to a culture where the expectations of it are different/less (as I did)! It's good to have connected.